Doctors from Plymouth will be supporting a study to investigate whether routine heart scans for hospital patients with chest pains will help reduce heart attack rates. Professor Carl Roobottom, Consultant Radiologist at Plymouth Hospitals NHS Trust and Plymouth University Peninsula Schools of Medicine and Dentistry, and Professor Jason Smith, Consultant in Emergency Medicine at Plymouth Hospitals NHS Trust, will work in collaboration with a team of researchers from around the UK to test whether heart scans can better diagnose patients at risk of a heart attack and reduce the number of deaths from the condition. Cardiac CT scans enable doctors to look at the blood vessels within the heart and detect abnormalities – such as thickening in the vessel walls – that could lead to heart attack. The doctors hope the scans – given soon after arrival in the emergency department – will also help to cut the number of patients who are unnecessarily admitted to hospital for further testing. Researchers have received £2 million from the National Institute for Health Research Health Technology Assessment Programme to conduct a clinical trial of the technology. “To date there have been few studies in this area, and where there have been they have focused on low risk patients who would have been sent home anyway. The study will be led by the University of Edinburgh and NHS Lothian in collaboration with Plymouth Hospitals NHS Trust, Plymouth University Peninsula Schools of Medicine and Dentistry and the University of Sheffield. The team are recruiting 2,500 patients from emergency departments at 30 sites across the UK, including Edinburgh, Sheffield, and Plymouth. In the UK, around 700,000 patients attend hospital emergency departments each year with chest pains. To avoid missing a patient with a serious problem, most people with even a slightly suspicious medical history are admitted to hospital for further testing. These patients are often given another type of test called an angiogram to look at the blood flow through their heart and identify any obstructions that could pose a heart attack risk. 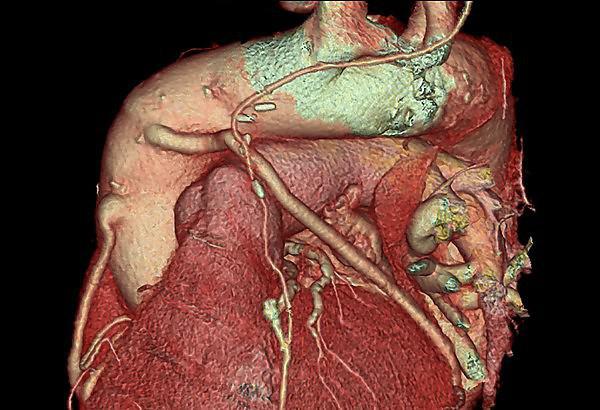 Cardiac CT scans are around an eighth of the cost of an angiogram and are safer for patients.